The long awaited ‘click to message’ from Google Adwords has finally arrived, and we love it! 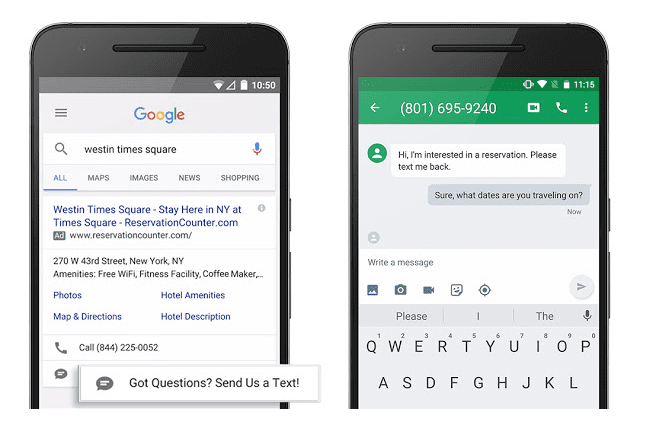 According to Google, 65% of consumers say they’d consider using messaging to connect with a business to get information about a product or service, or to schedule an appointment. Therefore, this brings the efficiency and effectiveness of messaging to search ads. The message extension allows your prospective customer/client to message you. These are very similar to the ‘click to call’ buttons that have been available on the Adwords platform for a couple of years now. By clicking on the ‘text’ icon allows you to text the company that is advertising to you. Once you click the icon, it opens your messaging app filling in the advertisers information for you automatically and can even provide you with an auto-populated message. When someone clicks your message icon, you’re charged for a click, just as if the person tapped on your call button or your ad to go to your website. This is helping mobile users once again, to make this experience as pleasant as possible, giving consumers even more flexibility than ever before. Google Adwords are constantly looking for ways to improve the mobile journey, only recently releasing their price extensions. With mobile search now overtaking desktop searches, you can be sure that Google won’t be stopping here with the mobile experience. 1. Message extensions allow you to dominate the mobile space even better, giving you more exposure for no additional cost. 2. They give your customers yet another way to get in touch with you, catering to everyone’s preferences. You’re making it even easier for your customers. 3. You can share extensions across adgroups and campaigns making it quick and easy to implement in your account.